Homecoming has always been about returning to roots to take stock. It’s a time for noticing how things in a place have changed – and how they’ve stayed the same – while noting those same changes in yourself. Grape crush, crunch Fall leaves on 3rd Street, Homecoming at Linfield College: If you haven’t been to McMinnville for a while, now is a great time to return to the small Oregon wine country town known for fostering conversations and inviting visitors to enter a slower pace. For Linfield alumni and students, Homecoming Week offers a great opportunity to reconnect with colleagues and friends in McMinnville, a place that has grown in prominence as one of America’s top small towns. 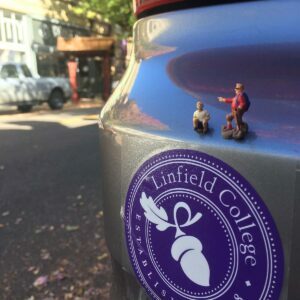 In Linfield as in McMinnville, a culture of smallness pervades community life, allowing conversations and deep connection to thrive over time. It’s worth taking a weekend to recharge and reflect on the value of small communities in maintaining deep connections. Headed back to McMinnville for Homecoming or for another Fall weekend trip? Here are some tips for places to revisit and reconnect. Downtown McMinnville with its hand-drawn storefront signs, charming facades, flower basket culture, and enveloping trees, feels familiar whether it’s your first time here or your fiftieth. Take your inner Wildcat for a walk down Third Street, America’s #1 Historic Main Street in America and perhaps the best backdrop for all those fall color photos. Some of the places in town that cater to students these days are Cupcake Couture, a women’s lifestyle boutique, Union Block Coffee, Local Flow health bar, and The Oak. Want to feel a place in transition? Discover the big changes afoot in the Pinot Quarter, where Oregon legacy wine producer The Eyrie Vineyards (the first to plant Pinot noir in the Willamette Valley) sits at the center of an emerging Alpine District. Stop in at Flag + Wire Coffee, a sweet spot for students and professionals alike, grab a brew at Heater Allen or Grain Station Grew Works, snag lunch at Valley Commissary. Linfield College recently added the nation’s first five-year Bachelors and Masters Wine Studies Program, which draws on the rich heritage of the wine industry in and around McMinnville (over 300 Oregon wineries are in Yamhill County). Overnight options proliferate for out-of-town guests, from swanky digs at downtown 3rd Street Flats and the Douglas on 3rd to the new luxury boutique Atticus Hotel, a place lauded for its authenticity and celebration of local culture. Country inn options put you out in the landscape with views of vineyards at the Abbey Road Farm, Youngberg Hill Farm Vineyard Inn, or in a sleepy part of town at A Tuscan Estate B&B. Class reunions for years ending in “8” (‘58, ‘68, ‘78, 88’ ‘98, ‘08) are happening all around town during homecoming week. For more information see the Linfield events page. Whether or not it’s your year to convene with your classmates, pop in on a visit with new Linfield President Dr. Miles K. Davis, the school’s 11th full-time president and its first-ever African-American in the role. With his welcoming attitude, visionary approach and those stylish socks he wears every day, Dr. Davis has become a veritable celebrity on campus in his first month. The “Meet the President “event is happening on October 6 at 10:30 a.m. at Nicholson Library. Linfield Wildcats host the Willamette Bearcats for the October 6 at 1:30 p.m. at Maxwell Field for the Homecoming Game. For more information on Linfield Homecoming Events, click here. Emily Grosvenor is the Editor of Oregon Home magazine. Follow Emily on Twitter @emilygrosvenor.